I like pesto, I really do, but over the years we've developed a love/hate relationship. Pesto gets points in my book because it's really versatile. You can make it with leafy greens of many varieties, not just basil. Whip up a quick pesto in your food processor and you've got a great way to make use of leftover veggies like Parsley, Mint, or even Arugula. What I don't like about pesto is that most recipes call for a whole lot of oil. Now don't get me wrong, I am far from a health nut, but excess oil in recipes bothers me. I almost always use less oil than a recipe calls for and often, get the very same results. Pine nuts, a usual component of pesto, are wonderful, but those babies are pricey and they go fast! 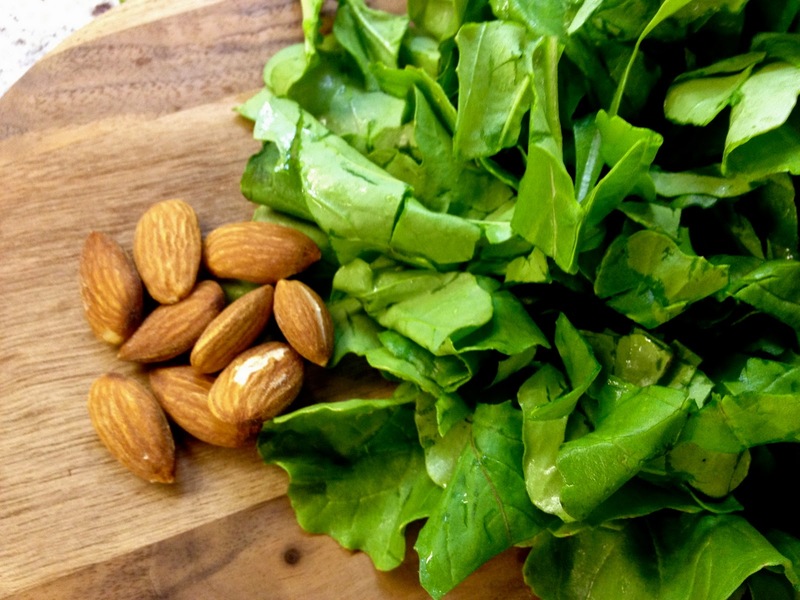 I've seen plenty of walnut pestos (mint and walnut pesto over lamb is divine), but what about other nuts, like almonds? My final issue with pesto is that it has such a bold flavor, it takes over the dish. This is good or bad, depending on the mood you're in or how you plan to use your pesto. 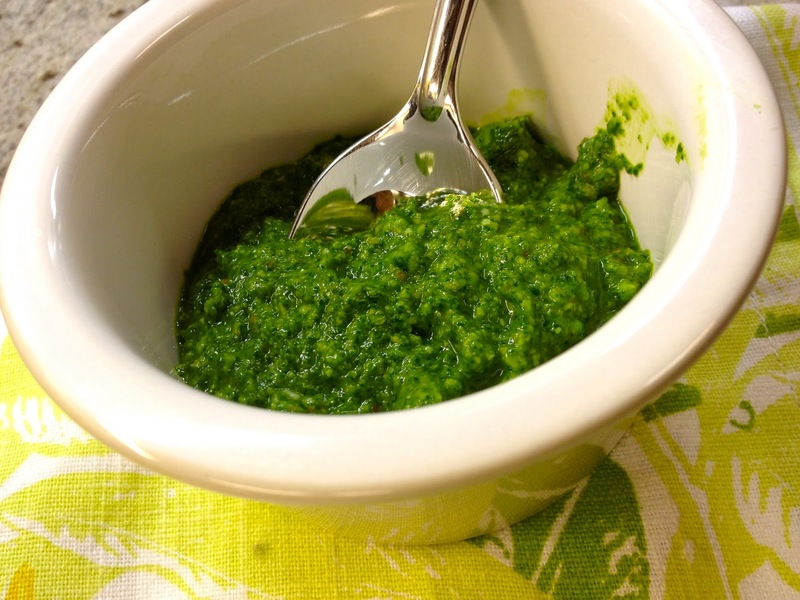 Would pesto be as tasty as more of a painted-on glaze instead of an oil based sauce? The questions haunted me. NK's Arugula and Almond Pesto "Glaze"
To serve, toss a few tablespoons of mixture with your prepared pasta, or in the case of delicate pastas like ravioli, paint the glaze on with a pastry brush. Now what did I do with our pesto and ravioli? 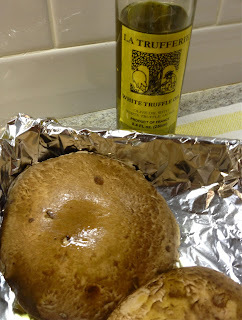 Below is a great dish for mushroom lovers like me that makes for an even more satisfying meatless Monday. Portobellos, the meatiest of the mushroom crew, are the key. Put Mushrooms in the oven to bake for 20 minutes. Set a pot of water on the stove to boil and prepare mushroom ravioli as directed. Glaze Ravioli immediately with Pesto using a brush or gently spreading on with a spoon. Slice Mushroom Caps into thin slices and place on top of the ravioli. Serve right away.